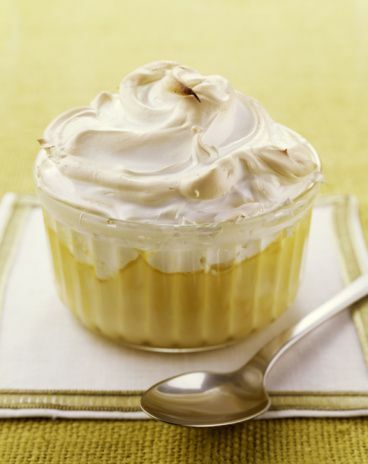 An easy banana pudding, made with banana cream pudding mix, vanilla wafers, and bananas, baked with a meringue topping. In a saucepan, combine pudding mix, egg yolks, and milk. Cook over medium heat, stirring until mixture comes to a boil. Arrange a layer of vanilla wafers in bottom of a 2-quart baking dish. Add a layer of banana slices and then a layer of pudding. Continue layering the vanilla wafers, banana slices, and pudding, ending with the pudding. Beat egg whites with the salt until foamy. Gradually beat in the sugar then continue to beat until mixture forums stiff shiny peaks. Spoon meringue over pudding, spreading all the way to the edge of dish to seal. Bake at 375° for about 10 to 15 minutes, until meringue is cooked and lightly browned. Serve warm or chilled. Store in refrigerator.